This template offers three separate page layouts: homepage with slideshow photo section and custom buttons, interior page one column layout, and interior page two column layout - set each individual page to the layout you prefer for that page. Editable PSD files included for easy customization of logo and custom, graphic buttons. All images featured in the preview pages to the right and in the live demo (click button above to preview this theme). All images are designed to be easily replaced with your own (if you prefer). Why launch a generic preschool website when you can choose something distinctive and fitting for your kid-friendly, inspirational environment? 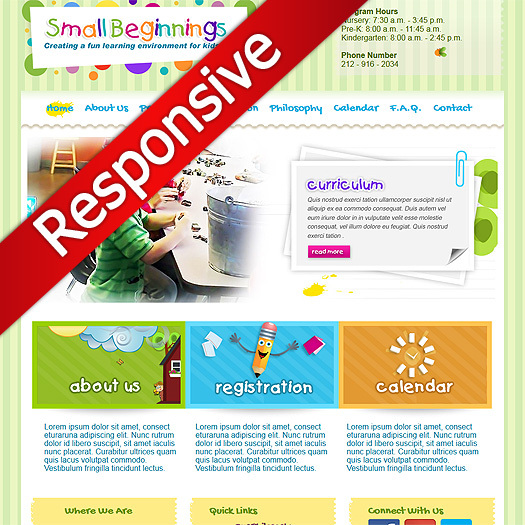 That's what led us to develop this new responsive WordPress preschool theme. With bright color accents, kid-friendly designs, and a user-friendly WordPress CMS admin, this may be the perfect fit for your kid school, preschool or elementary school program.